What’s the Worst Road You Have Driven On? A friend called me from the UK the other day to say that the place where I live now was featured on the telly. Brilliant, I said, I bet they are talking about the amazing local food and the astonishing festivals. No, he replied, it’s a programme about the worst roads in the world. You might have seen it; truck drivers go over skinny mountain passes and almost plunge to their deaths due to rickety bridges. I watched an episode and it didn’t look all that bad but then I guess I am used to South American roads now. When I first came here they terrified me. To see how far my attitude has changed I decided to search online for the worst roads in the UK. Is Blackpool So Bad After All? 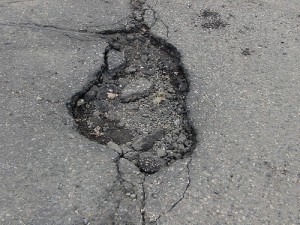 It seems that Blackpool has the poorest road surface in the country but the story about it has a picture of a laughably small pothole which I wouldn’t even bother trying to avoid now. Didn’t The Beatles talk about there being 4000 holes in Blackburn? Now that is more like it. I honestly can’t remember driving on a truly bad road in the UK but the worst one I ever got on is in Bolivia and is called La Cuesta de Sama. It is basically a long uphill (or downhill if you’re going the other way I suppose) stretch of a few miles. It is unpaved and unlit, has sharp turns and no crash barriers to protect you from a huge drop below. The side of the road is unsurprisingly littered with crosses. Did I mention the fact that it is also a busy route for buses and giant trucks driven by buffoons? We nearly got pushed over the edge by one when he mistook my hesitation in launching myself off the precipice as meaning that I wanted him to shove me off. I survived the trip (obviously) but blew out a tyre and spend 3 hours shivering in the cold trying to change it. If you haven’t ever tried to change a tyre on a 4 x 4 on a dirt road in the dark with trucks whizzing past your frozen ears then I urge you to try it. It makes worrying about that Blackpool mini pothole look a bit silly by comparison. This entry was posted in News and Views and tagged Aston, Blackpool, Bolivia, La Cuesta, LS, mini, South America, South American, UK by Robert Bell. Bookmark the permalink.